CRM engages customer’s data analysis with the company to improve business. 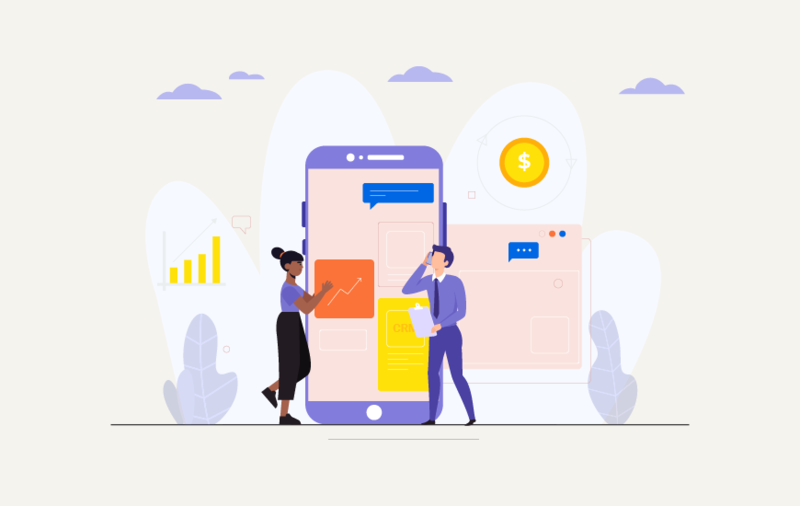 The rise of mobile devices, and the always-on connectivity that goes along that has profoundly changed both businesses and their customers. It’s likely your customers interact with your organization through a mobile device much of the time, and nearly as likely your employees work with them through mobile devices – or they will soon. It’s no surprise then that mobile apps have flourished in the world of business software just like they have among consumers. Mobile customer relationship management (CRM) applications are designed to allow employees to interact with clients or data using smartphones and tablets. Sales professionals, customer service employees, and field service staff can answer questions, access data, and process orders, resolve issues, and close sales no matter where they happen to be. Let’s take a look at some of the benefits a mobile CRM solution can have for any business. Customers expect any business they interact with to have an online presence to make interaction easier. They may be visiting your website during the evening or, in the case of business-to-business transactions, may be working in a different time zone. Yet, they may expect the same responsiveness as during regular “business hours.” Mobile CRM app integration fits into their lives because it gives employees the flexibility and accessibility needed to allow customers to feel that contacting your business is second nature. A business should be where its customers are, which means embracing social media, chat apps, and mobile-friendly e-commerce platforms. A mobile CRM app can also make it easier for your company representatives to monitor communication channels from social media and instantly respond to complaints or issues as they arise. A company’s handling of problems on social media makes the news headlines just about every day now. Make sure your company is accessible in the public’s mind with the help of a mobile CRM application. Customer service employees are no longer tied to their desks, they, along with sales teams and field service agents, can all be more productive. Research shows that companies gain upwards of 240 productive hours of work from employees who use mobile devices for work. Another advantage of mobile CRM applications is making data more accessible to employees. Order forms, agreements, receipts, quotes, and more can all be handled directly within a mobile CRM application. Data can be updated instantly and accessible to all who are authorized. These CRM applications help employees to access consumer data at lightning speeds. They also help representatives stay on top of your company’s latest promotions, or offers, which help make selling much easier! With such easy access to your company information, you save your company and customer’s time. When a customer is interacting with your presence online, they expect instant answers. Interaction through social media, such as Twitter and Facebook, has become the norm for customer contact. Any business that does not embrace social media and its customers are missing out on a valuable revenue stream. Mobile CRM applications gather feedback left by your customers on social media and turn them into actionable tasks for your customer service department. Your sales reps can offer deals to customers who are thinking about a product on your site or ask if they have any questions before purchasing. This instant communication helps build brand trust with new customers and turns them into returning customers. Traveling employees and those who work remotely can be more productive with a mobile CRM application. With instant access to your company’s data, their presence in the office is no longer required for them to be a productive employee. Studies have shown that mobile CRM can also improve the quality of data received from sales representatives. If reps have to wait to get back to the office to enter information, some details may be forgotten. But with instant access via mobile CRM, data can be inputted as soon as it is received. With up-to-date data at their fingertips, your sales representatives are better equipped to close on sales. They can respond to customers’ questions more quickly and accurately, which is what customers expect in today’s always connected environment. Your employees no longer have to be in the same building or even the same country to work together. Everyone in the organization gets access to the same data, regardless of the platform they are using. Most mobile CRM support smartphone, tablet, and desktop use for a more collaborative work environment. Mobile CRM solutions can also help companies with their marketing campaigns. Targeted advertising campaigns that can be delivered to personal devices are just one way to market using a CRM. Push notifications can be designed to alert customers of new promotions, leading to higher conversion rates. Targeted advertising can be augmented with up-to-date data to help you focus on those customers who are likely to respond to a particular promotion or deal. If your business doesn’t have a mobile CRM solution in place for employees to interact with customers, you’re missing out. These applications make it possible to garner instant feedback, help close sales, improve access to data, and generally make for an improved customer service experience. Mobile CRM applications also help your employees stay in sync no matter where they are. They can become more productive the instant you switch to a mobile CRM solution. Are you convinced that a mobile CRM solution will give your business a boost? The next steps involve researching your business requirements and comparing CRM solutions. Afterward, it’s time to select and implement. Thankfully, software selection firms exist, such as Technology Evaluation Centers, whose experts assist businesses through this critical phase.